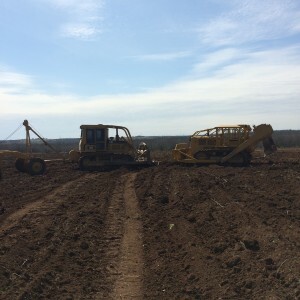 Graham Construction & Land Clearing offers several different land clearing options in order to tackle your brush removal project in the most effective way possible, depending on your land usage goals and the unique issues you want tackled. We understand it is important to evaluate each individual project so that the land is minimally impacted. Our ultimate mission is to improve the quality and the appearance of the land. Root Plowing is utilized to rid your property of thick, invasive brush, such as Mesquite and Huisache trees. If left unchecked, these species can take over your property within a few years, rendering it useless for grazing and recreational activities. The Root Plowing land clearing technique involves several steps in most cases. depending on how tall or thick the brush is. If the brush is too large to plow over, it will have to be dozed into large piles. The second step is to use what is known as a root plow to cut the root of the trees below the bud zone. This is usually 8 to 10 inches below the surface. Next, we will use a wheel rake to collect the additional brush into piles to be burned at a later time. The wheel rake also levels the ground after the plowing process is complete. The field must be raked 2 times. The final step in the process is to disk the field with a Rome Disk to bring up any roots or stumps that may have been missed by the raking process. Disking also helps to smooth out rough spots in the field. If the brush isn’t terribly dense, an Excavator is a great alternative to Root Plowing, which is a more invasive procedure. This process works well on several species including Cedar, Juniper, Mesquite and Huisache. When using an Excavator combined with a grubbing attachment we target individual trees and remove them by cutting below the bud zone or the root ball. Excavator Grubbing is a great method in the Texas Hill Country where there is not much soil and we need to minimize disturbing the earth. Forestry mulching has gained in popularity as a method of clearing land in recent years. It is a great method to rid your property of cedar and juniper trees, as these species will not re-sprout once the tree is cut down. Forestry mulching eliminate shaving brush piles to deal with after the clearing operation is complete. The mulching head also adds a layer of mulch that will help to build up the soil and insulate it from the element. The mulch also acts as a form of erosion control, giving grasses and other ground cover time to take root. Forestry mulching is not a recommended method to control Mesquite or Huisache, as these two species will re-sprout unless cut off below the bud zone of their roots. In deep, sandy soils, Yaupon trees can get so thick that it’s difficult to walk through them. These trees are incredibly difficult to clear permanently. For the best results, a dozer with a rake pinned onto the blade should be used to remove the roots. If Yaupon trees are cut above the ground, the trees will continue to comeback and will rapidly be just as thick and difficult to deal with as they were before. At Graham Construction & Land Clearing, we offer additional services to maximize the potential of your space. Whether it’s additional site work including leveling and properly grading your property in preparation of a future project or to help with wildlife management, fabrication of customized metal buildings and fencing, as well as septic installation – we can help you through many different property improvement projects.